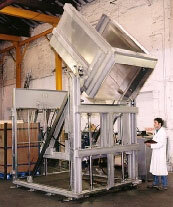 Tilter Pre-Lifts are perfect for applications where the lift is required prior to tipping in environments where lifting chains are not acceptable such as food processing and dusty atmospheres. This design can also be used for ‘Variable Height Tipplers’ where semi-mobile machines are required to discharge contents into differing height of hoppers. Dual control allows independent lift and tip operation to provide the most acceptable pouring edge position thereby minimising risk of premature spillage.